I always strive to make each show I do a little different from the last show I’ve done … and from … the next show that I will be doing. I believe the show; on Saturday … July 27, 2013 … exemplifies that on so many different levels. I am sure that this particular show did make most of my listeners somewhat uncomfortable …. and, may even have made some of my listeners … squirm. The topic was not a new topic per se …. and, it is one that many are, in fact … talking about. But on that day … I do hope that I did turn up the volume a couple of notches. That … with the help of my two wonderful guests callers … Lisa Bonnice and Stacy M. Kananen , co-authors of the book …FEAR OF OUR FATHER. “Today we are talking about sexual abuse and we are talking about physical abuse. Oh, I know … already … someone one is saying … wait a minute … what about mental abuse. My response to that is simply … how can one be sexually and/or physically abused without it abusing one mentally? I know that there are statistics out there claiming that child molestation, sexual abuse and physical abuse is rampant and it is on the rise. However, statics are simply information that has been compiled based on available data. This is a problem that I believe is much worse than any available statistics. Child molestation, sexual abuse … and physical abuse is a crime. It is a crime of stigma …of shame … and … for the most part … it is an invisible crime. No … not for the abuser, but for the abused! This has got to stop! I say to the ABUSER … if you have any remorse in what you have done or in what you are doing ….tell someone and get help … before you do any more harm. I say to the ABUSER who has no remorse or feels no regret, may you burn in hell. You are, in fact a murderer and a robber … you steal and you kill the very soul of a child. I say to the Parents, brothers, sisters, Aunts, Uncles, cousins, neighbors, friends … who automatically reject the claims of abuse by someone … or simply look the other way out of fear of retaliation … or they don’t want to feel uncomfortable at “family gatherings” …. shame on you. YOU might be the very person to help save and change someone’s life. Please … at least consider what I am trying to say. The name of the book that we discussed that morning is Fear of Our Father …. co-authored by Lisa Bonnice and Stacey M. Kananen. Stacey’s story is one of physical, sexual … and mental abuse … so horrific, it not only decimates an entire family, and encourages family betrayal … it ends in the brutal murder of two people. Actually for Stacey, the murder of her parents wasn’t really the end …but … the beginning of a new kind of terror. This true story demonstrates abuse at its very worst and the horrific consequences and events derived from that abuse. However, child molestation and physical abuse are devastating for the abused/victim on any level. It not only tears entire families apart … it destroys one’s soul. It is time for us all, as a society … to bring the abusers out of their dark holes of invisibility and comfort and expose to the world what they really are. It is time for us all … as a society … to rally around the abused … the true victims … and let them know they are loved, their abuse validated, and that there are many who will listen … and, who will fight for them to get them out of those situations. If we seriously want to make changes in this great country, for the better … this is a great place to start. The link to the archived show …. “FEAR OF OUR FATHER: True Story of Abuse, Murder, & Family …. You Can Ask Marti Rulli About The Mysterious Death Of Natalie Wood – Case Re-opened. In November 1981, a beautiful legendary Hollywood star was lost forever. But the mystery behind Natalie Wood‘s untimely death lingers on to this day. Just when one thinks the case has been closed forever as an accidental drowning, the case has suddenly been re-opened. 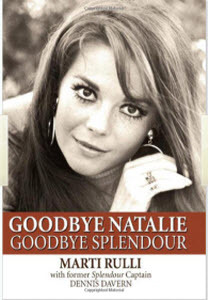 Marti Rulli, author of “Goodbye Natalie Goodbye Splendour” will be joining the Debbie Barth and Joyce Bagley at On The Grid Internet Talk Radio just hours before her interview segment on the television show, 48 Hours Mystery, being aired that evening. She and the boat captain, Dennis Davern, have been trying to get this case re-opened for 25 years. In 2009, Ms. Rulli and Mr. Davern co-authored the aforementioned book, hoping that it would bring new life to solving the mystery surrounding Natalie’s death. Recently, others have come forward with information so compelling, the local police department has announced the re-opening of this case. It has brought not only new life to the case, but controversy as well, as lines are being drawn between those who believe the case should be opened and those who believe that the media is simply wanting to cash in on the 30th anniversary of Natalie Wood’s death. But neither side can deny that there are questions that are begging for answers. Why would Natalie try to go out alone at night on a dinghy when she had a terrible fear of the water. Why wouldn’t Robert Wagner allow Dennis Davern to turn on the search light and immediately radio for help upon announcing that she was missing. And who heard a women’s cry for help that night from a boat anchored in the vicinity of the Wagners’ boat? Ms. Rulli tells her story about what really happened prior to Natalie Wood’s death, and how the truth to what really happened took on a very distorted spin, with the help of the misinformed media, bad police investigating, and Hollywood influence. You will have your opportunity to ask your questions this Saturday morning, Nov. 26 at 10:00 am EST. Call in to talk with Ms. Rulli at 323-792-3071, or visit the chatroom at http://www.blogtalkradio.com/onthegrid, and ask your questions there. Meet Patricia Booth-Julius: Sharing Her Memories of Dean Martin and So Much More! This blog post gives me much pleasure, for several reasons. One being that I am blessed to be sharing the spotlight with two other very classy, savvy, and a bit … ummm … unconventional ladies, at On The Grid, a Blog Talk Radio internet talk show. Secondly, because the first two shows have been celebrated with wonderful reviews and huge support. Thirdly, because the show coming up this Saturday, 15, 2011 at 10:00 am ET will be with singer/dancer/entertainer Patricia Booth-Julius (aka Patty Julius). And fourthly, because I am privileged to know Patty personally and I know for a fact that she is as beautiful on the inside as she is on the outside. (And she is beautiful). So, without further adieu …. please read below. Patricia Booth-Julius had performed over 32 different musical comedies and light operas before she ever left her home in St. Louis, Missouri, to find her career as an entertainer. This came as no surprise to those close to Patricia. She started voice and dance lessons at the very early age of three, and received her Actors Equity Card when she joined the St. Louis Municipal Opera (“Muny”), while still in high school. Her talent, drive, and determination at the “Muny” lead her to work with Broadway superstars like Ethel Merman, Douglas Fairbanks, Jr., Eddie Albert, Florence Henderson, and John Raitt. She has danced with Tommy Tune during an audition, and was not only immediately hired to perform with The Gene Kelly Show in Las Vegas; she performed a solo dance with the legendary Gene Kelly, as well. To date, Patricia hasn’t missed a step and is still performing … doing concerts, print work, and commercials. 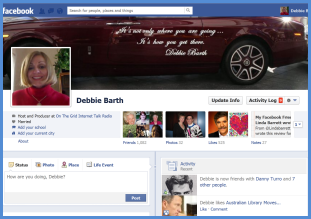 Join Debbie Barth and Joyce Bagley On The Grid … Saturday, Oct. 15, 2011 at 10:00 am ET …. as Patricia talks about what it really takes to be successful as an entertainer, her own experiences … and her memories of Robert Goulet, Frank Sinatra (and more!) and of course, the very beloved, Dean Martin. Join us in the chat room at www.blogtalkradio.com/onthegrid, or call in at 323-792-3071 to listen by phone or to speak with Patricia Booth-Julius, personally. On The Grid is, after all, where real life happens!